Rihanna Responds To A HORRIFIC Racist Tweet Saying She'd Look Better "If She Was White"
Fresh after the premiere for her latest movie, 'Valerian And The City Of A Thousand Planets', Rihanna had to face one horribly racist message, from one of her apparent fans. 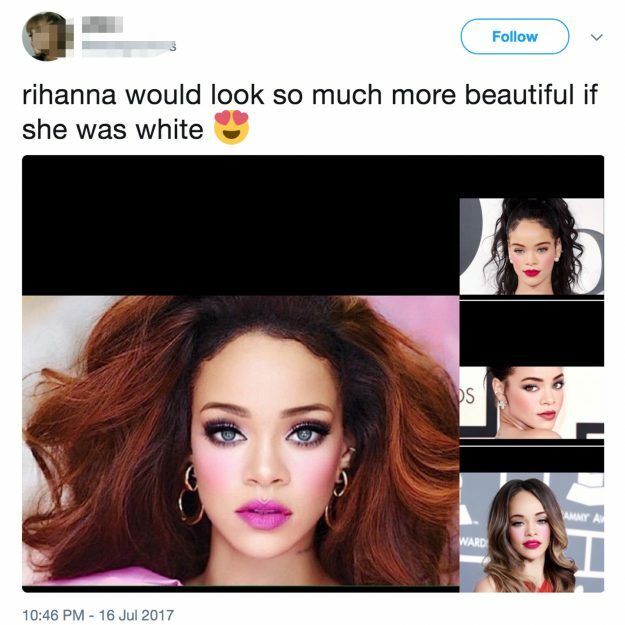 The post in question read as "Rihanna would look so much more beautiful if she was white", accompanied by four Photoshopped images of the 'Work' singer with a much lighter skin-tone. Unsurprisingly, this message didn't go to well with RiRi's fans on Twitter. And it definitely didn't go down too well with the singer, herself, after she took the high ground and reacted in the right way. Having seen the message, she blocked the user, just to prove that this Twitter troll couldn't get to her. In fact, the 'fan' later wrote "Rihanna blocked me how did she even see it?" This caught the attention of Rihanna's Navy, who questioned the fan for the disgraceful edit. NOTE: If you're going to praise your fave's appearance, don't do it with racism. She's got talent. Tom Holland's got talent... So what happens when you merge the two of them together? !